Next time you're scanning the "You Pick Two" menu, look for these healthy menu items. It can be tricky to eat well when dining out, but seeking out healthy fare is worth the effort: According to recent research, each meal eaten out is associated with a slight increase in body mass index (or BMI). And who eats out just once a week? Taken with another analysis showing that meals from fast-casual restaurants, including Panera, can have significantly more calories than a fast food meal, a several-times-per-week dining out habit (be it breakfast, lunch or dinner), can lead to a lot of unwanted pounds. If unwanted pounds aren’t bad enough, restaurant meals are also typically high in sodium, yet low in fiber and whole grains, and many don’t contain adequate produce. That’s true even at Panera, where the health halo of clean ingredients may trick you into thinking that everything on the menu gets the green light. It doesn’t. (Chicken Tortellini Alfredo and Frontega Chicken Panini, I’ve got my eyes on you!) Still, dining out is a convenience we all rely on so to help you avoid the unhealthiness and keep things light, I drilled down into the nutrition information of the Panera menu for the best offerings and looked for ways to make them even better. 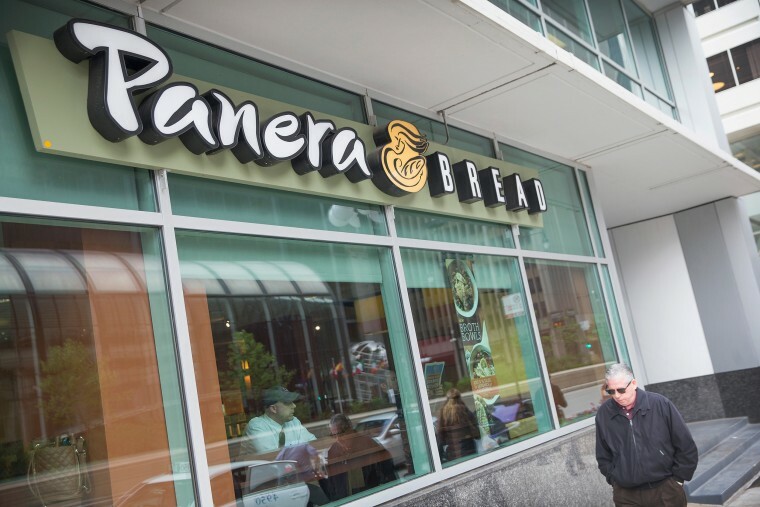 Here are your healthy Panera Bread picks. This sandwich would make a filling and nutritious start to your day. I’m a fan of the flat bagel, which cuts about 20 g of carbs when compared to Panera’s whole grain bagel. Plus, it contains sprouted grains, which are easier to digest than regular whole grain breads. Sprouted grains also make the nutrients in grains more bioavailable. The healthy fat from the avocado together with the 21 grams of protein (mainly from the egg whites) and 7 grams of fiber (from the bagel and veggies) means this is a meal that will curb hunger and fuel busy days. The combo of steel cut oats and quinoa gets the thumbs up in my book. I can’t even quibble with the drizzle of honey since it’s only providing about a teaspoon of added sugar. The only thing missing from this meal is produce, so I’d pair it with the Summer Fruit Cup to balance out breakfast. The steel cut oatmeal base makes this another winning breakfast. When compared to cold cereal, oatmeal has been shown to increase feelings of fullness and satisfaction, so if cereal is your morning jam, oatmeal is a good choice. However, too much added sugar is a personal pet peeve so I’d skip the cinnamon crunch topping here. You’ll still get one and a half teaspoons of added sweetener from the granola it comes with. To cut back even more, you can skip both toppings and opt for pecans, instead. Doing so boosts your healthy fat intake, which is a nutritious move. This sandwich is layered with lots of veggies, which is why it makes the cut. Instead of the tomato-basil bread it’s served on, get it on the sourdough. Doing so brings the sodium down 250 mg — still high at 980 mg, but an improvement. Bring it down another 250 mg by choosing avocado instead of feta. The swap brings avocado’s vitamins and minerals to your meal and ups the fiber another 4 grams. For those craving a turkey sandwich, this one gets my vote, but I’d suggest eating it open-faced since most adults could do without the extra carbs, calories and sodium from refined breads. Skipping the bacon would shave 200 mg of sodium (and 100 calories) from this meal — worthwhile nutritional savings if you ask me. There are plenty of healthy ingredients, like olives, kale and romaine lettuce, in this main-sized salad. Like most restaurant meals, the sodium is high, but 300 mg of salt is coming from the Greek dressing. Order the dressing on the side and drizzle lightly — just enough to add flavor. That will keep the sodium in a healthy range. The Caesar Salad is a classic choice, although not without its landmines. As with other salads, my advice is to get the dressing on the side and use just enough to coat your greens. Since the black pepper croutons don’t add anything by way of nutrition, try skipping them and getting your crunch from the optional pecans instead. Whole foods provide a nutritional boost over processed ones, and in this case, pecans stand out with more than 19 vitamins and minerals, including key nutrients like vitamin E, calcium, magnesium, and potassium. Choosing pecans over the croutons also lightens the carb load. This meal meets all of my nutritional requirements: Not too much added sugar, lots of produce, hearty levels of protein and fiber (to keep your belly full), and sodium levels (just 280 mg) that are hard to match in restaurant meals. Have it with the Sprouted Whole Grain roll if you like (yes, you heard me right!). This bean-based soup is a satisfying, plant-based choice that provides almost 70 percent of your daily fiber needs. Note, however, that it’s really high in sodium — above 1,000 mg out of the 2,300 mg limit recommended for healthy adults. To lighten the sodium load, choose off the “You Pick Two” menu. You’ll get a smaller portion, which naturally lessens the sodium levels. Pair it with the Seasonal Greens Salad and remember to go easy on the side serving of dressing. And make sure you drink plenty of water and meet your fruit and veggie quota throughout the day. Both will help your body flush out the extra sodium. What makes a good pick?